Minox has introduced two new high-quality spotting scopes, the MD 60 Z and MD 80 Z. Both employ a “folded light path” design that makes these optics much more compact than conventional spotting scopes. With 20-60X magnification and a retail (MAP) price of $1398.00*, we think the MD 80 Z could become popular with long-range shooters who prefer a straight-through optic. With 12-40X power, the ultra-compact MD 60 Z ($1298.00 MAP), would be a good choice for hunting applications. We hope to get an MD 80 Z to test soon. These should be hitting dealers’ shelves by late April. We like the folded light path design for two main reasons. First, this puts the heavy objective lens much closer to the tripod mount, reducing the amount of overhang (or cantilever). In practice, this makes the scope much more solid on the mount. With other long, heavy spotting scopes, even with a sturdy bipod, just a slight touch causes the scope to jiggle or shake. We’ve found with some of the big 80-88mm (objective) spotting scopes, it is almost impossible to focus the scope without causing it to jiggle a bit, which takes a while to settle. With a shorter spotting scope with the balance point much closer to the mount, the “jiggle factor” is much reduced. The compact design also makes these Minox spotting scopes much easier to transport and tote around. The MD 60 Z and 80 Z will easily fit in a medium range bag or utility box. If you regularly use a spotting scope you’ll appreciate the compact size and portability of the MD Series units. The Minox MD eyepieces have ample 30mm eye relief. 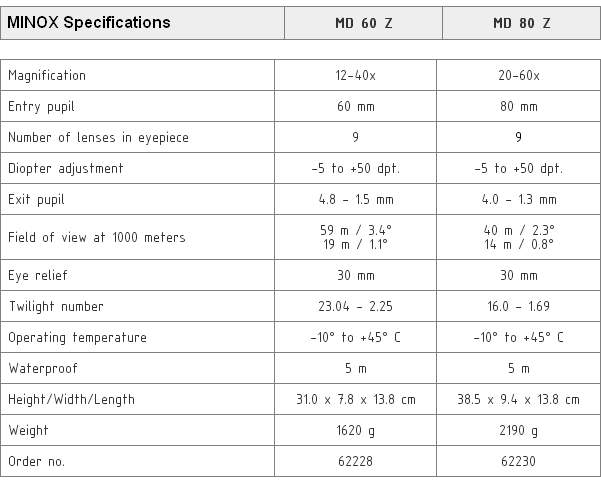 Notably, Minox gave these spotting scopes a huge range of diopter adjustment, from -5 to +50. This means that just about any person can use the optics with no need for glasses or corrective lenses. No angled eyepiece option is offered on either the MD 80 Z or MD 60 Z. If you’re spotting for a fellow shooter from a seated position, a straight eyepiece makes sense. On the other hand, for prone shooting, when you’re spotting your own shots, most folks prefer a spotting scope with an angled eyepiece. When shopping for a spotting scope, determine how you will most commonly use the optic. This Editor owns both a straight spotting scope and an angled spotting scope. I use the straight spotter most of the time, except when I am shooting prone. 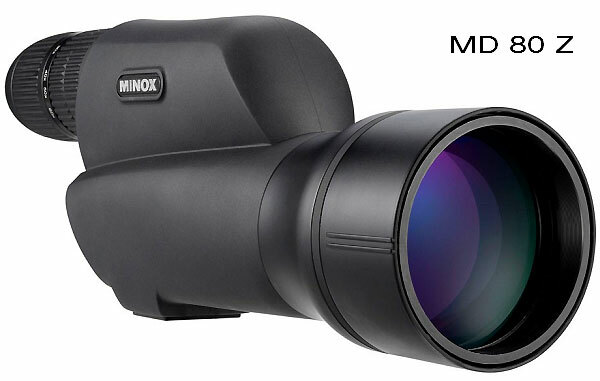 If you really need an angled spotting scope, Minox does offer an ultra-short, 16-30X MD 50W spotter. This is one of the most compact angled spotters on the market, and it weighs just 24.3 ounces! * The MD 80 Z’s Minimum Advertised (MAP) price is $1398.00 while MSRP is $1498.00. MAP price for the MD 60 Z is $1298.00 with a $1398.00 MSRP. Share the post "New Compact Spotting Scopes from Minox"
Each Wednesday, the U.S. Army Marksmanship Unit publishes a reloading “how-to” article on the USAMU Facebook page. 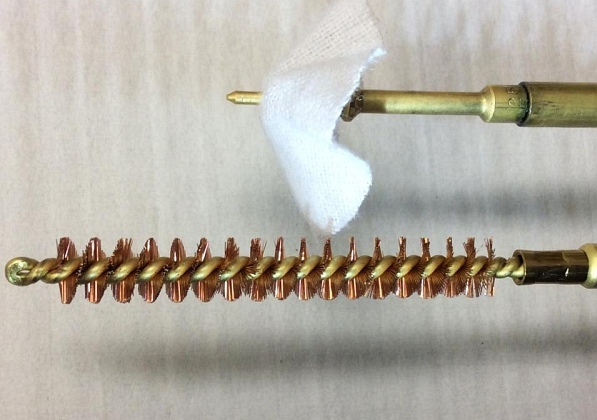 Today’s “Handloading Hump Day” post covers bore-cleaning, specifically the use of pull-through style bore snakes. Visit the USAMU Facebook page each Wednesday for helpful tips. 1. BORE SNAKES: MIRACLE REPLACEMENT FOR THE CLEANING ROD? 2. 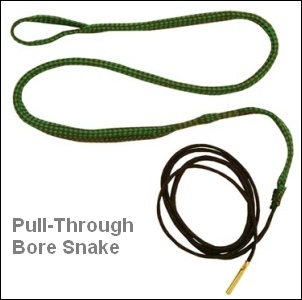 SO, WHAT ABOUT BORE SNAKES FOR BARREL BREAK-IN? Share the post "USAMU Talks about Pull-Though Bore Snakes"